We're all checked in now and here's some photos of both the room, the upstairs of it and the views, of course. The views here are second to none really. 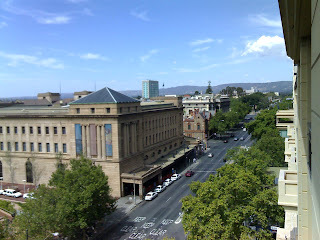 Looking out the window I'm reminded as to why I love this city and the entire state - it's just too bloody picturesque. We're at the Sebel Playford Adelaide. Located on North Terrace is used to have other names, the Radisson is what most people would know it as. Otherwise who knows and who cares? We've got what's called the 'Loft Suite', a charming split level place. Decent enough really...but then you expect that from a 5 star dump. Now it's time to settle in, kick back and just chill before people arrive to do the Keith Moon. Luckily for all concerned there's some PayTV music channel going with all kinds of funky sounds from the '70s and '80s. Life is good...roll on 2007! 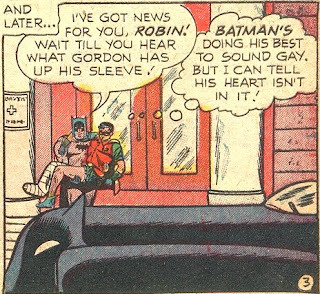 Poor Robin. I mean, we always knew didn't we? You got it, it's gonna be that kind of a day. We've decided to check into one of the better hotels here for tonight's carrying on, and once we're there I'll take some happy snaps and update the blog, so you'll be able to get some idea of what's going on, where and when. Mind you by about 11pm I fully intend to be as pissed as a little beetle, so only expect this to go so far. But here we go - post #1. Or, as Chadwick calls them, Christmas Wounds. Last night we were deciding if my dodgy knee would hold up to partaking in Chadwicks long overdue birthday drinks when the choice was taken from us. You see the other half fancies herself as a jack of all trades and with good reason - she is. 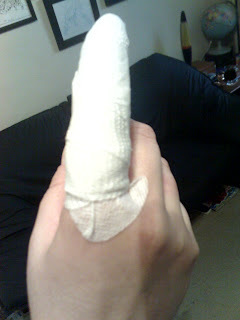 Where I can't hammer a nail into a block of wood without crushing thumbs (sometimes my own!) she can build a dining setting, complete with chairs and mini-bar, and all of which would put the average store to shame. Certainly the stuff she can make is far better than the crap you find in the so called professional stores if only because she uses real wood and not painted chipboard. I've said it before, she can write, paint, draw, take award winning photos, build anything she wants, but she just can't be bothered. Once she masters an art she then moves on to the next project. But I digress somewhat. So last night I'm sitting, resting my knee and hoping it'd come good. Recently I was asked why don't we have FoxTel? I mean it';s not like we don't like our idiot box here and we did rush out and buy a digital set-top box just so we could access the extra Channel for Channel 2. So why no pay TV? Well here's your answer. ME: "I'd like to get FoxTel installed please." 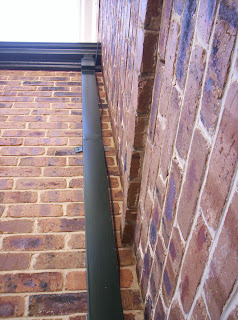 FOXTEL: "Well we'd have to check to see if your unit is able to be wired." ME: "I'm pretty sure it is." 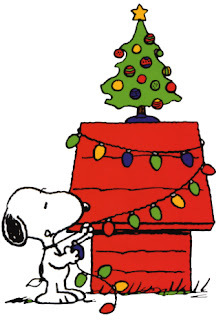 One of the distinct advantages of living in Australia, we get Christmas a day earlier than most other places. Still, as Roy Thomas just pointed out to me, he gets to celebrate it for a bit longer. And it's a beautiful day here today - the sun is finally shining and all is well. That Claus guy has clearly been but, just like when I was a kid, I have to wait for the others to wake up, although I can see that Merlin (the legendary cat) has sniffed about the pressies, obviously trying to scope out if he's gotten any catnip this year. The joke is on him, the nip is mine! 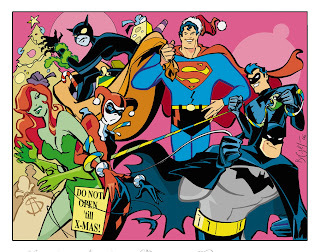 Have a safe and merry Christmas people...for one day of the year hopefully everyone everywhere can all put differences aside and just be of good will. May all our wishes be granted in 2007 and may the disappointments and sorrow of 2006 vanish with the last drink on December 31st. A new year is coming and a new beginning for one and all!!! Classic 1970s Marvel. 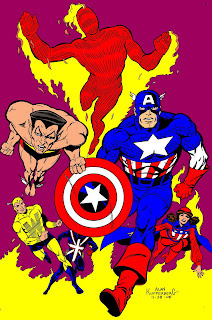 The brainchild of Roy Thomas, the Invaders first 'appeared' in The Avengers #71 (December 1969) as part of another on-going story. Roy then used the characters again in another one-off appearance - the classic Timely trio of Captain America, Namor, the Sub-Mariner and the original Human Torch - as part of the now legendary Kree-Skrull war, which also ran in the pages of The Avengers (issues #91 through to #97). This time Roy even gave them a battle cry, straight out of Timely Comics, 'OK Axis, Here We Come,' although Roy has stated that he lifted the cry from the title of an article written by the late Don Thompson. You can thank the ultra talented Al Bigley for the image you're seeing. Ain't it a stunner? Al is a class act and one of the nicest guys I know. Always happy to work on a project, always happy to have an email chat and just too damn good. So, that's 2006 done for. Home and hosed. I know, there's still nine days to go, but I think it's safe to have a look back and reflect upon the year that's gone and see what's coming ahead. So tell me, what's wrong with this comic? 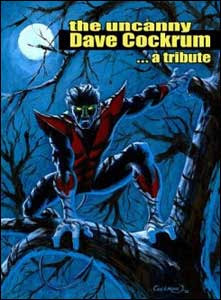 It's one of the more obscure titles from the Marvel line of comics, and one that pretty much everyone associated with has forgotten about, or chooses to forget about. Selective memory perhaps? Of course it is. Solarman boasted some incredible talent for such a maligned book. Written by Stan Lee and with art by Jim Mooney and Dennis Janke on issue #1, and Mike Zeck and Nestor Redondo on issue #2, this was a book that should have scaled the heights. But sadly it didn't. So exactly why did it fail? This just arrived in the email today from Clifford Meth. Dave Cockrum, the best friend that Aardwolf ever had, has passed away at the young age of 63. We already miss him deeply. Aardwolf previously announced a special reprint of The Uncanny Dave Cockrum Tribute in hardcover, but over the past six months we’ve worked with Dave to complete the project. Edited by Clifford Meth, this beautifully bound new book will contains over 20 pages of new, original Cockrum artwork as well as art contributions from Dave’s many peers, including Neal Adams, George Perez, Walt Simonson, John Romita, Marie Severin, Joe Kubert, Will Eisner, Travest Charest, Joe Quesada, Jim Lee, Dave Gibbons, and many more; written tributes to Dave by Stan Lee, Roy Thomas, Neil Gaiman, Alan Moore, Harlan Ellison, Marv Wolfman, Len Wein, Chris Claremont, and Peter David. 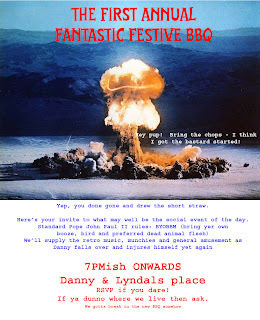 So here's the official invite to our first Fantastic Festive Feast/BBQ. That took me about five minutes to whip up in PhotoShop. You might need to click on it to appreciate the detail. I've sent it out to the people we wanna invite - but hey, feel free to ask and I'll think about it. Nut cases not rquired as we'll have a fairly good compliment of crazy bastards on site. Funnily enough that's about all I can do today, oh, that and watch the cricket. Somehow I've managed to injure my shoulder and it's making writing a pain that's intolerable. No transcribing for me for the duration, which is a pain in itself because the amount of tapes I have here to catch up on is starting to depress me. Well colour me stunned!!! Just last week I discovered that Iced VoVos were selling for a measly $1 per packet, well down from the usual $2.50+. So, here I am, buying up all the VoVos I could afford and BANG!! they're gone! And even worse - in their place is a sign saying, 'Discontinued'. How could this happen? It's not like it's a horrid little biscuit, like Ginger Snaps (they're bloody foul), a VoVo is an almost perfect tasty treat - biscuit base, jam (not bloody jelly - it's JAM, you idiot*. You're in Australia now. And while I'm at it which cretin renamed Peanut Paste Peanut Butter? And Lemon Spread is now Lemon Butter? Give me a freaking break!) and piles of coconut. You can always tell when someone has eaten a packet of VovVos - they're sleepy, content and covered in coconut residue.